Table Talk with C and C: Five for Friday and Friday Flashback! Five for Friday and Friday Flashback! 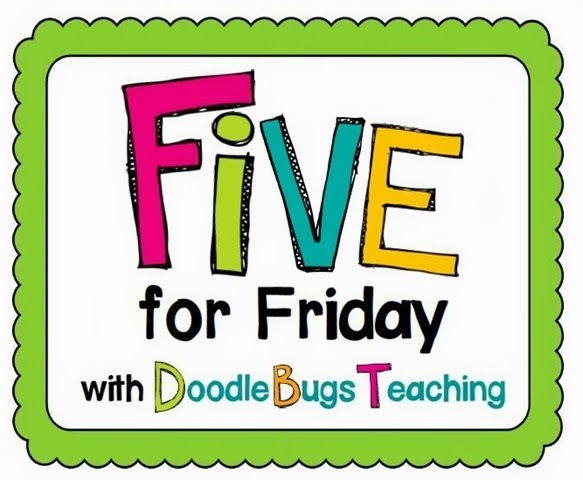 Today I am doing my first link up Teaching Madness for Friday Flash Back & Doodle Bugs Teaching for Five for Friday! This week has actually been quite busy and lots of fun, so I am excited to share about my 5 random things! 1. FAIRY TALE WEDDING! 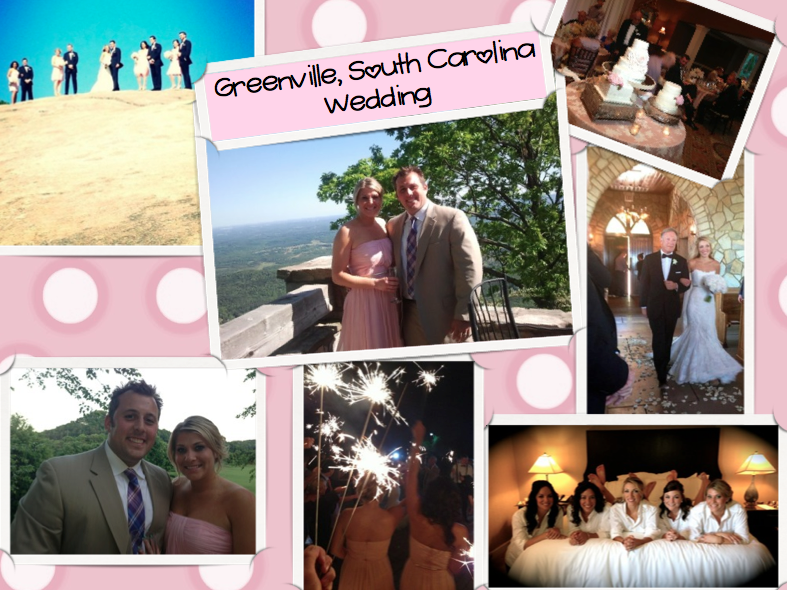 Over Memorial Day weekend my husband and I got to spend our weekend in Greenville, South Carolina to celebrate the wedding of my dear friend! For those of you who have never been to South Carolina, like me, it's definitely worth a trip! 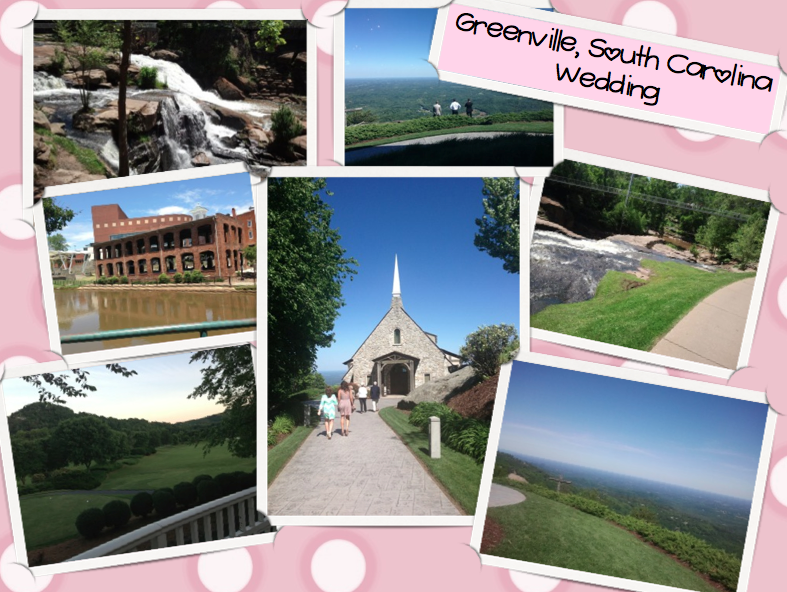 The landscape in the Greenville area is beautiful with lush green mountains, cute and quaint town with tons of yummy restaurants, gorgeous golf courses, beautiful weather. There is just something about the fresh air there that is different than the Chicago air. It was so refreshing! So anyhow, my girlfriend was the most stunning bride and every venue for the wedding was just impeccable! From the chapel on a cliff, to the champagne toast overlooking the mountains, to the serene banquet room at a gorgeous golf course, delicious food, great entertainment, and the beautiful decor I couldn't imagine a more perfect fairy tale wedding! #2. FAIRY TALES! Speaking of fairy tale weddings, these past 2 weeks Carrie has been teaching the students about Fairy Tale elements and comparing different versions of fairy tales during whole class read alouds. Students listened to Cinderella, Goldilocks and the Three Bears, Jack and the Beanstalk, and more with many various versions and twists! 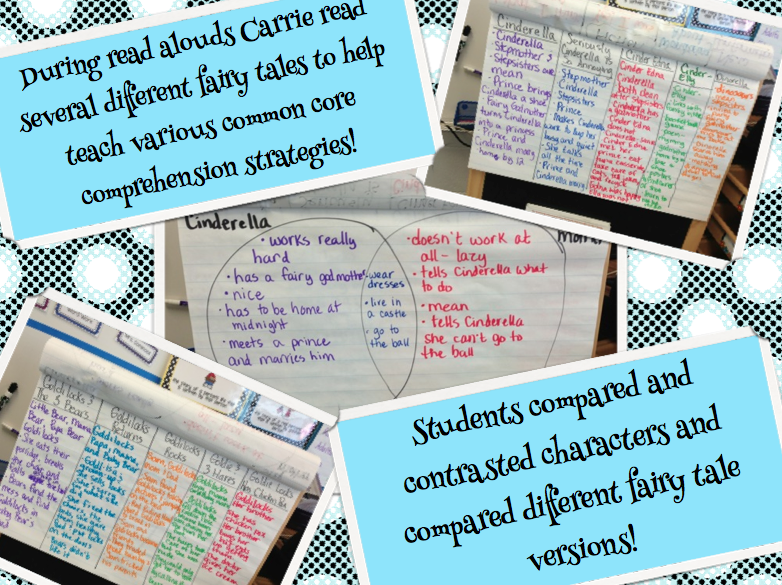 Students participated in whole class comprehension strategies such as compare and contrasting characters, comparing several different versions of a particular fairy tale. 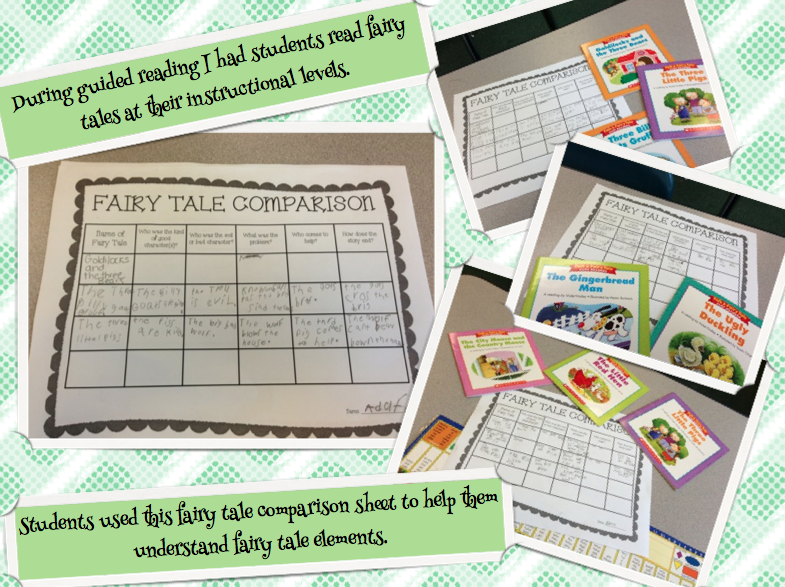 To go along with this fairy tale unit, I took it a step further during guided reading time and created a Fairy Tale Frenzy unit that focuses on several different comprehension skills with fairy tales! Fairy tales are such a great way to reinforce retelling, sequencing, making connections, summarizing, understanding character traits, problem/solution, fluency, cause/effect, etc. Pretty much the ideas are endless and I wanted to put a package together that touched on a little bit of everything! 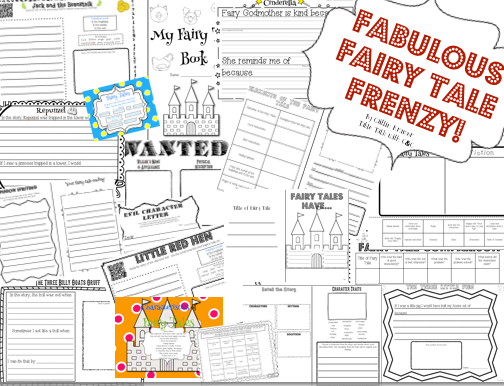 So a few days ago, I had the students use the "Fairy Tale Book" graphic organizer that is the the Fairy Tale Frenzy package. Students got to pick any of the many read alouds that had already been read to them to read independently. 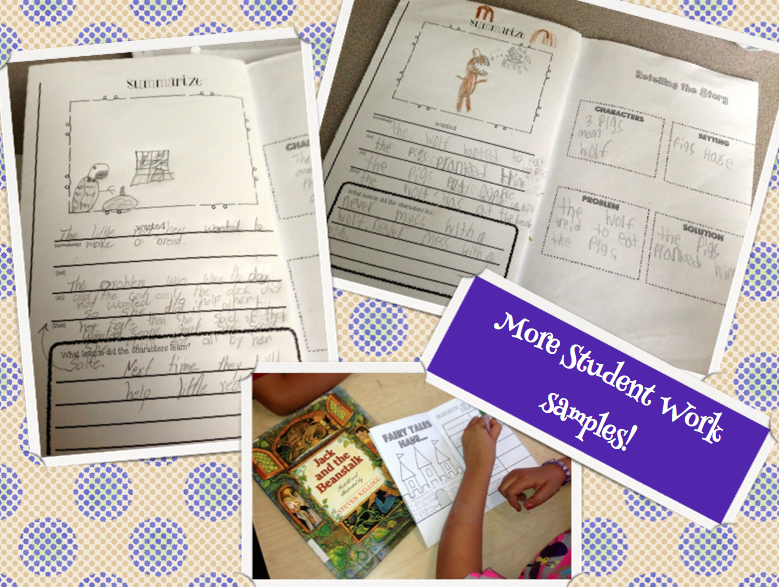 Students then used their "Fairy Tale Book" to complete all of the comprehension strategies with the book they chose! This was a great end of the year comprehension activity to see how well students could apply different strategies all within one book, and all on their own!! This is the first BIG product that I created and I'm thrilled to share it with you! 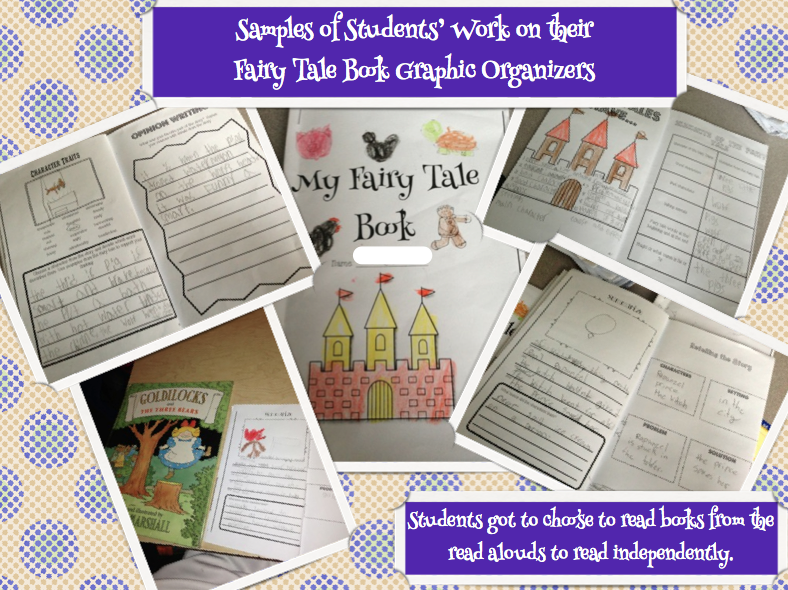 It's a small price to pay @ only $4.99 for 50+ pages worth of fun fairy tale activities and graphic organizers, BUTTTTT I'm giving it away to three lucky winners! You can enter to win through next Thursday, June 6th! (Our last day of school!!) We will randomly select three lucky winners and reveal them on Friday, June 7th! 3. Pin one of the fairy tale pictures onto your pinterest and leave the pinterest URL in your comments. 4. Leave your email address on your post. #3. 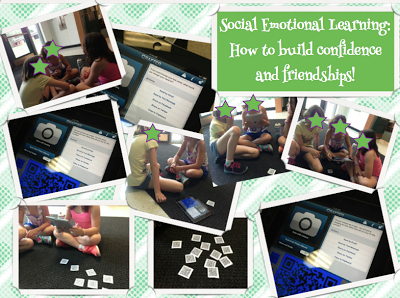 SOCIAL EMOTIONAL LEARNING WITH QR CODES! On the flip side of my reading intervention services that I provide to students, I am also a special ed teacher and work with students with social emotional needs. I have been working with my little 2nd grade student for the past 2 years and can't believe how much she has grown social/emotionally!! :) I have been implementing our ED curriculum called STRONG START to help her work on nervousness, self-esteem, courage, taking risks, building and maintaing friendships, effort, and active listening skills. 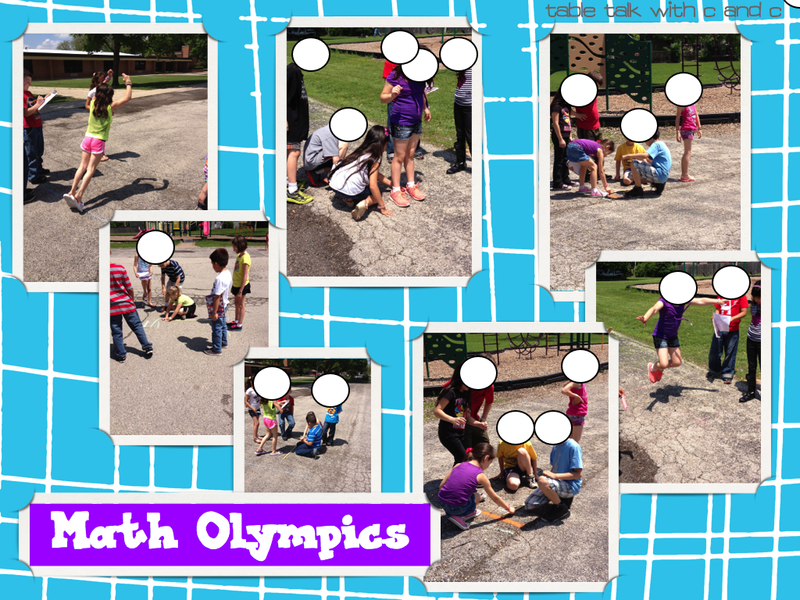 Today we got to do a fun activity with QR codes. The last few days we have been working on the skill of "How to Be a Good Friend." First we read the book "Rainbow Fish" and discussed how Rainbow Fish was not a good friend at the beginning and how his feelings changed throughout the book once he got some help. We then did an activity where my friend listed qualities that make a good friend and how to ask a peer to play with you. #4. 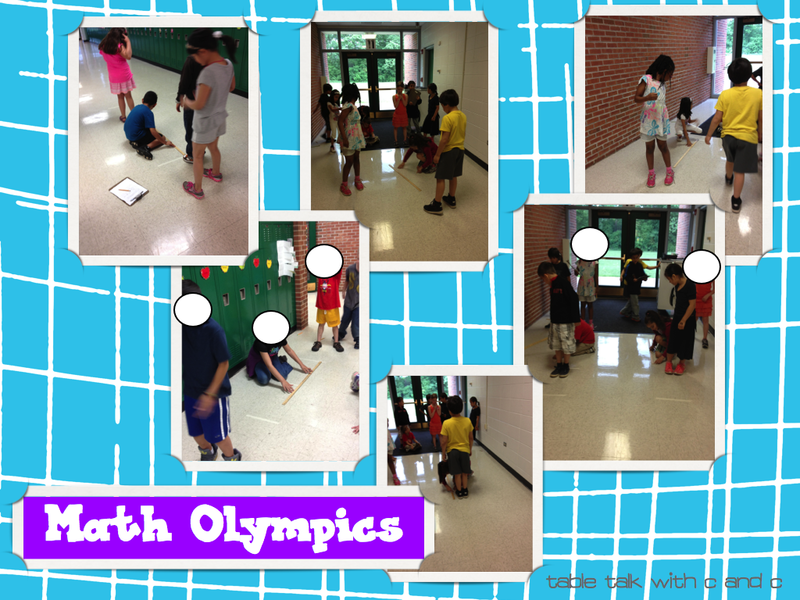 MATH OLYMPICS! 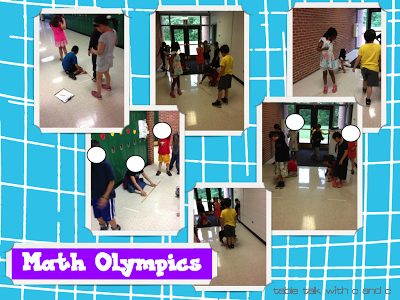 Yesterday, the 2nd students got to participate in our very own math olympics!! Each of the 8 second grade teachers all had a fun, kinesthetic game that involved different concepts that the students worked on this year! Activities including stacking paper cups with basic addition and subtraction facts, throwing soft balls into buckets and adding 3 digit by 3 digit numbers, measurement, addition and subtraction with dice and more! At the end all of the students earned a cute little gold medal for all of their hard work this year! Our activity was measurement. 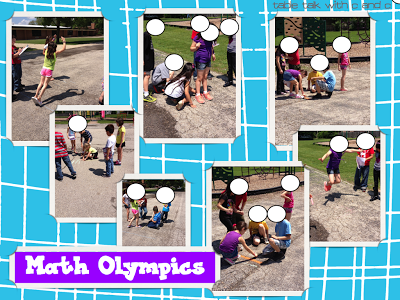 We had a "measurement relay" and a "measurement hunt". The first group had to be indoors due to rain, but the last few were able to work outside! 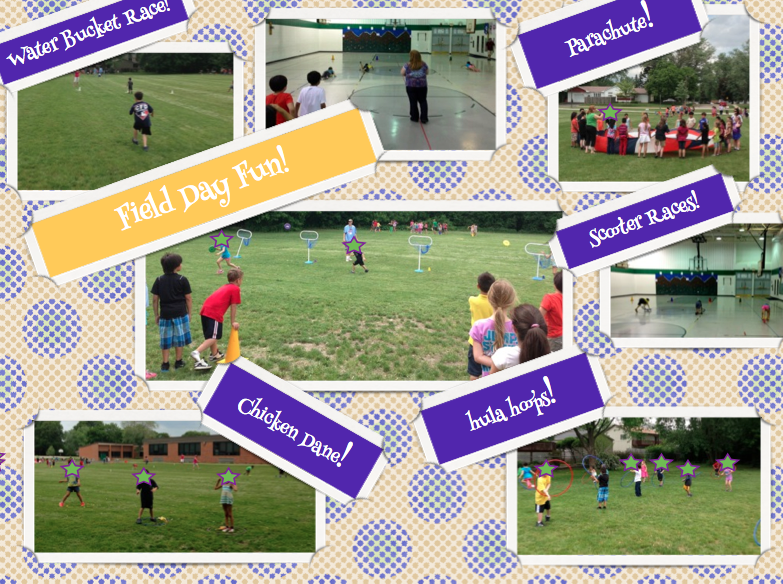 I hope you have enjoyed learning a little bit about our fun and busy week! Can't wait to hear what everyone else did! I 'm from the beautiful state of SC! So glad you enjoyed your visit. Next time, head on down to Charleston for some more southern hospitallity! Thanks for visiting my blog! I have an issue with my "smart" phone because I see cute stuff on Instagram and then I don't remember to go back to them when I get on the computer. Thank you for reminding me! I saw your post on the fairy tale unit and I wanted to go check it out! I did a "Cinderella Around the World" unit last year with my first graders and we ended with an opinion piece on their favorite version. I love your unit, it is super cute and it would go nicely with what I'm trying to accomplish with my firsties! Thanks for the awesome giveaway! I'm your newest follower!